Green tea with almond milk, most mornings in bed. Slow chicken and steamed vegetables for lunch. Black tea and cuties for afternoon snack. 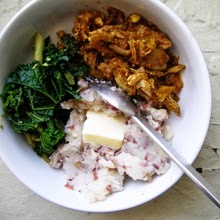 Slow meat, greens, and mashed potato for pre-workout dinner. 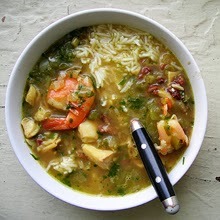 Fish soup for Friday night! Mint almond latte, dried fruits and nuts for post-workout snack. 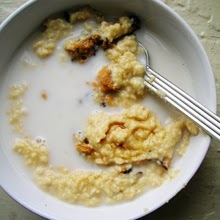 ETA: Egg in oatmeal with a touch of maple syrup over sweet potato bean mash for post-workout snack. 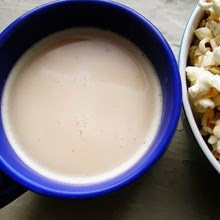 Buttered rum and coco popcorn for Friday evening snack. I'm rotating out butter coffee on Saturday and Sunday, these are less relaxing and more working days and I'm having regular breakfasts for them. I do have butter coffee capabilities at work now, though, in case you were worried I'm not getting enough butter. I'm getting a jump on egg bites, which is my spring breakfast. I have that option, late in the season. Just getting antsy for winter to be over, eggs in veg puree is a cozy thing to eat in the dead of winter and egg bites with avocado and tomato feel like a little harbinger of spring. I burned out a little bit on sweet potato and am switching in mashed potatoes and beans, very good. I might do sweet potatoes just for fall, and switch to mashed potatoes in winter. That seems more right for winter, I think. ETA 3/8/14: I made a little adjustment that I will talk about when I get back, but now I get this uber-delicious oatmeal for my post-workout snack. Until. spring. comes. Late winter food planner for the extremely detail-oriented.